Jul 25, 2018 | What Am I Reading? Samuel Maguire’s debut No Point in Stopping (Tiny Owl Workshop 2018) is a memoir novella, a compact, taut piece of writing that is simple and unpretentious, and probably one of the best insights into mental illness I have read. His words and depictions make sense; I really ‘got it’. Described as ‘a memoir of fisticuffs, magic and meds’, and subtitled ‘Fortune Favours the Brave’, the book is a unique and touching glimpse of living with bi-polar disorder. 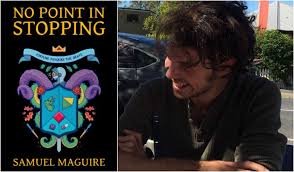 Through a mixture of magical realism, voices in his head, imaginary battles and real-life conflicts, Maguire shares a part of his complex story. Through spare language and everyday events, we journey with him as he struggles with his demons and confronts his adversaries (both true and illusory), as he makes connections with family and friends, and as he attempts to define and wrestle with his condition. In the Editor’s Note, Harlan Ambrose writes: ‘Memoir isn’t just about hard facts. There are undiscovered truths and lessons in the space between what’s real and what’s imagined.’ He praises Sam Maguire’s ‘courage and compassion’ in telling his story. I couldn’t agree more. Memoir is a brave step for any writer, to open up past wounds and examine what caused the hurt, and how (or if) they have healed. Maguire does this with a refreshingly honest and frank assessment of his own actions, a dry humour, and from an empathetic perspective. He reveals some of his earliest memories of ‘difference’; his realisation that something set him apart. He interrogates these recollections and attempts to reconcile them with his adult experiences. Set in Brisbane and grounded in the reality of drugs, alcohol, house-sharing and prescribed medication, the story introduces us to Sam Maguire’s world of magic and created (and creative) illusions, and manages to present his wild head-spin fantasy adventures as not only possible, but comprehensible. The story is full of horrendous nightmares and disturbing crises of identity, but also offers up gems of wisdom and truth, small glimpses of the profound. His dreams are frightening in their intensity. He speaks of control and premonitions, sadness and craziness, self-belief and anxiety, belonging and connection and writing. His distinctive voice guides us with guileless wonder, and for the briefest of moments, we see what he sees, we feel his pain, his longing and his hope. In the end, he concludes that ‘sometimes all you have to do is keep breathing for a few more hours and you can make it home’, and that ultimately, there is indeed no point in stopping.